Belfast City Airport has been sold to a Spanish construction firm for £35m. The price paid by Ferrovial is at the lower end of expectations - and reflects the level of competition from Belfast International Airport, who were also bidding for the airport. Against that, the Spanish company is buying an airport that has had £28m spent on it in the last five years. The deal takes Ferrovial's tally of airports around the world to 13 - it also owns a half share in Bristol airport as well as Sydney airport in Australia and several in south America. In a statement on Friday, Ferrovial said that the purchase represented an opportunity for growth in a strategic area and that it saw room for further development at the airport. When the airport went on the market last year, several companies expressed an interest. More recently, detailed negotiations have been carried out with two companies, TBI, the owners of Belfast International Airport, and Ferrovial. Canadian owners Bombardier said the airport was "no longer seen as a core part of its business strategy". The company acquired the airport when it bought Belfast aircraft company Shorts in 1989. Bombardier said that while there would be a change of ownership "the airport will continue to operate and to develop its position as a fundamental part of Northern Ireland's transport infrastructure". 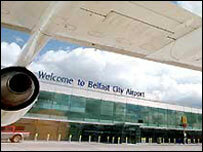 Belfast City has been open for commercial air traffic since 1983. Currently three airlines - bmi British Midland, British European's flybe and British Airways CitiExpress - serve some 18 destinations in Great Britain daily. Approximately 1.8 million passengers are expected to use the airport this year. About 360 people are directly employed by the airport with a further 450 airline and other staff based there. "Ferrovial said it saw room for further development at the airport"